Digital agenda lures new breed of partners to 2016 Microsoft Worldwide Partner Conference in Toronto. With a sea of flickering lights shining onto the stage, Satya Nadella exposed the world to Microsoft’s new way of thinking. In laying out his vision for the years ahead at 2016 Microsoft Worldwide Partner Conference in Toronto, the forward-thinking CEO spoke of a digitally driven world, outlining how Redmond is building the business brain of the future, underpinned by an intelligent cloud and a changing partner network. But sometimes, it’s not what you say, it’s what you don’t say that counts. In dedicating a 90 minute opening keynote to the notion of digital transformation, drilling down into its impact on businesses and industries, Nadella addressed a new breed of partner. For the last time Microsoft and its changing channel descended on Toronto, the partner makeup was different. Four years on, new faces litter the crowd, with born-in-the-cloud partners, startups, Systems Integrators (SIs) and Independent Software Vendors (ISV) outnumbering the traditional value-added resellers (VAR) and transactional players. 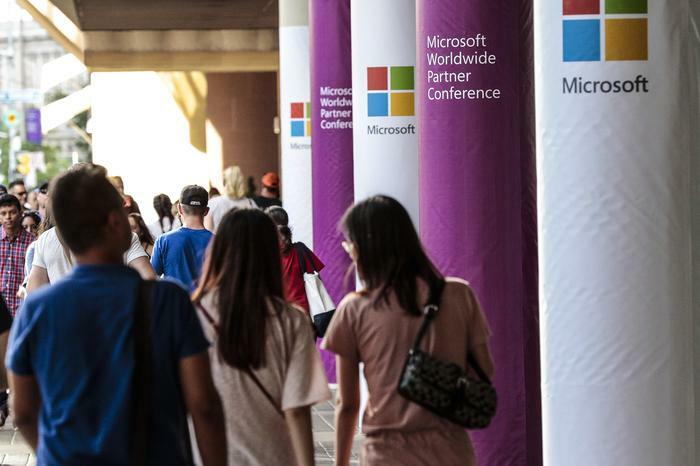 Of the 16,000 partners in attendance - a record-breaking haul - 40 per cent are first time attendees, demonstrating a sizeable shift in the Microsoft partner ecosystem. Triggering such a shift is the tech giant’s focus around reinventing business processes, utilising the huge graphs of information now available. “Businesses of all sizes in every country will not just use digital technologies, but become digital companies themselves,” Nadella said. 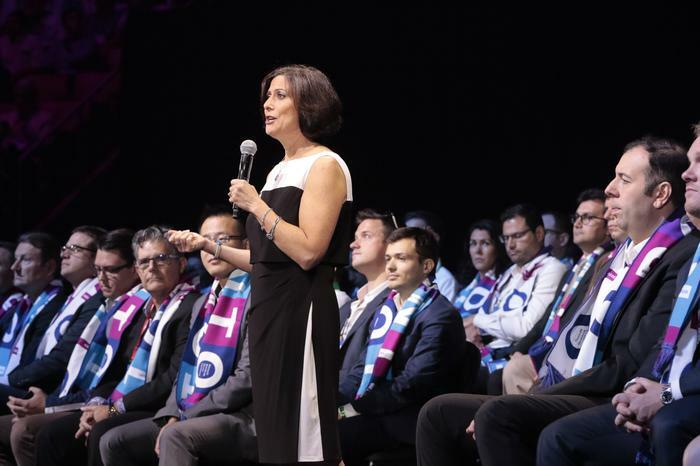 Whether it be data and analytics, mixed reality, cognitive services or new powerful algorithms, the air of intelligence permeating through the Canadian city showcased the smart bets at play. “This is a million miles away from the notion of traditional reselling,” added Microsoft Director of Partner Development, Phil Goldie, when speaking to ARN on the ground in Toronto. With a week of announcements still to come, the biggest story coming out of Worldwide Partner Conference will no doubt be the changing face of the channel, as Microsoft’s digital agenda drives traditional resellers away, and new partners to the table. Fresh from Cortana recapping the momentum of the past twelve months, Nadella took to the stage to emphasise the digital outcomes that CIOs consider top priorities. 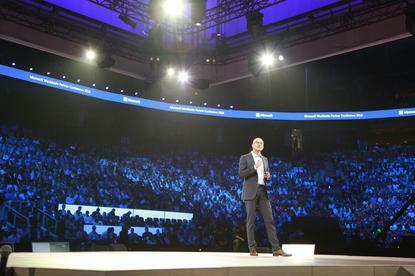 After showcasing C-level testimonials from Adobe, PayPal, General Electric and Best Buy among others, Nadella explained that digital change isn’t just restricted to the larger end of town, carving up new opportunities across small and medium-sized organisations. With a digital mandate clear, Nadella warned partners that such change won’t happen with “another bolted-on cloud app” or “a giant implementation of monolithic and closed business application packages”, highlighting a shift towards a more creative way of thinking. Echoing Nadella’s comments, Goldie told ARN that value can be derived through specialisation for partners, representing a shift in thinking for the market. “The focus is around industries, customer verticals, customer sizes, geography and specific business problems,” he explained. Central to Microsoft’s blueprint for future growth is Dynamics 365, and its ability to provide built-in insight and intelligence within business applications, through apps such as field service, sales, finance and operations. Following its release last week, Microsoft is bundling its CRM and ERP solutions into one new cloud platform, providing the vendor with new ammunition to gun down industry rival Salesforce. Key to the success of Dynamics 365 will be its ability to unlock data stored in silos, and through its integration with Office 365, provide purpose-built Software-as-a-Service applications with intelligence built it. “Each system of intelligence needs to be centred around a person and encompass anything that the person needs to do in the context of their role,” Nadella explained. Nadella said the systems of intelligence require a platform where any business or ISV can add unique value to a company’s digital transformation by extending and integrating its existing systems and business processes. “The world is digitising and when you look ahead there is an increasing drive for better productivity and efficiency, creating a new for digital services and products,” he added. “Business leaders, imagine a world where your employees are empowered with predictive insights, prescriptive advice and actionable next steps. IT professionals, imagine a world where you can quickly build and deploy what you want and pay for just the capabilities you need. “Developers and ISVs, imagine a world where you can build systems of intelligence to transform business for every company of every size in every industry. In looking ahead, Nadella predicted ongoing change in how businesses approach digital transformation, and how it will be played out in the Cloud. As customers embark on digital deployments, the art of making bots understand natural language stands tall as the new way to utilise compute power. Revealed at the Build developer conference earlier this year, Microsoft played out the bot use case on stage, demonstrating the value of Conversation-as-a-Platform (CaaP) and how humans and computers can form complementary ways of working, in a Man with Machine type scenario. “Digital transformation requires the continuous wiring and rewiring of digital feedback which taps into the power of the Cloud, the power of the graph and the power of data,” he said. “We still have to navigate operating systems, use individual applications and learn about menu structures but what if we could teach computers to understand human language. Exposing the industry further to its future way of better enabling productivity, Microsoft also made its biggest pitch yet for HoloLens to be used as a business computing device, evident through the vendor’s on stage demonstration focused around jet engine training. In showcasing a workplace similar to a huge multi-monitor desktop setup, through the tap of a finger a jet engine model emerged, detailing the intrinsic nature of the model and how to navigate around its complex structure. Yet this was no traditional desktop, rather played out in front of an empty table on stage, visualised through an augmented reality headset that threatens to reshape the way businesses maximise the notion of mixed reality. “When you change the way you see the world, you change the world you see,” Nadella added. With digital transformation at its core, Microsoft is becoming smarter as it builds the business brain of the future. But as the ecosystem transforms in tandem, partners are faced with two options; lead or leave.